On Intimacy is a program of works built up around an essay/piece of the same name by Eugene A. Kim. Contributing composers include YoungEun Kim, Cindy Giron, and (collaboratively) Christian Smith & Douglas Farrand. Sound installation for the University of Orange's 9th Placemaking Conference featuring recordings of lectures by community leaders in Orange NJ discussing the relationship between FAITH and WORKS, underpinned by a slowed down recording of music composed and performed by Dr. Margaux Simmons. A six hour long solo performance for cassette tapes, stones and various objects, sine-tones, and whistling. Written and premiered at the request of Kristi Meal and Rust Belt Books in Buffalo NY on the Sunday before Thanksgiving, 2016. Subsequent development and performances of the piece in Pittsburgh PA and Cleveland OH in March 2017. 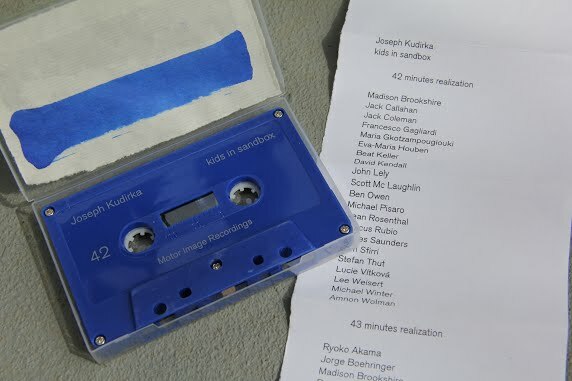 Cassette tape with a 42 minute and 43 minute realization of Joseph Kudrika's kids in sandbox score. Featuring Madison Brookshire, Jack Callahan, Jack Coleman, Francesco Gagliardi, Maria Gkotzampougiouki, Eva-Maria Houben, Beat Keller, David Kendall, John Lely, Scott Mc Laughlin, Ben Owen, Michael Pisaro, Dean Rosenthal, Marcus Rubio, James Saunders, Sam Sfirri, Stefan Thut, Lucie Vítková, Lee Weisert, Michael Winter, Amnon Wolman, Ryoko Akama, Jorge Boehringer, Douglas Farrand, Tim Parkinson, Mark So, Lee Weisert, & Michael Winter. Edition of 100, with original cover art on each tape. Purchase at motor image recordings. Cassette tapes featuring geese calls recorded via Cornell Ornithology Lab webcam on side A and sequences of chords derived from Konrad Lorenz' book about greylag geese Here Am I- Where Are You? on side B, recorded to celebrate a birthday of each pieces' dedicatee. realized in Oberlin OH from 2011-2012.